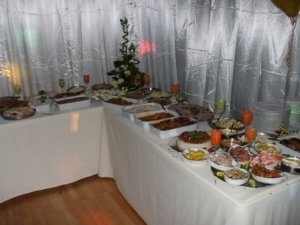 We are able to offer a flexible catering service that can be adapted to fully suit your needs. Our catering team is led by an experienced volunteer team who have a passion for the food they produce and serve bringing the home cooked feeling to all of our meal options. We also use local suppliers for our food wherever possible, for example the burgers and sausages on our BBQ menus are supplied by Pipers butchers in Durham Market. Most of our food is home cooked on the premises and if you don’t like something on the menu or if there is something you would really like – tell us and we will do our very best to accommodate your choices. Plus just about anything else you might like, curries, pie n’ peas, haggis to name a few – try us. We also offer competitive working lunches for our conference clients.